Get ready to impress your friends with the festive shimmers and gentle movement of our new Large Anywhere Lighting Silver Love Rings! 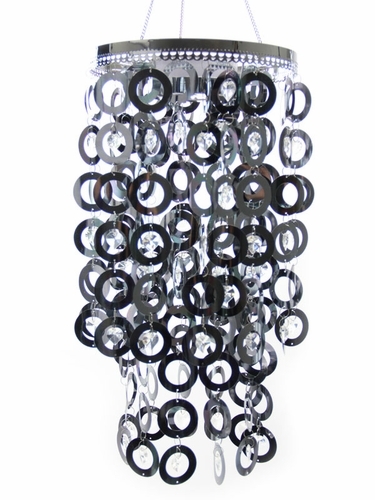 Glimmering all day long in the reflective sun with precious jewel Heart love accents, this exciting Silver Chandelier will also deliver a wow of surprise in the evening with a stunning LED light! Built upon a sophisticated and durable metal frame design, and available in 6 different colors. No hard wiring or special hardware needed for installation, just install x2 D batteries, securely hang in desired area and turn on! The automatic timer turns on the LED Light every day at the same time you set and it stays on for 5 hours before it shuts off to save power. A beautiful accent piece to any home and garden, hang indoors or outdoors! Makes for fun decor in the office, or a perfect addition to any stylish porch or backyard.